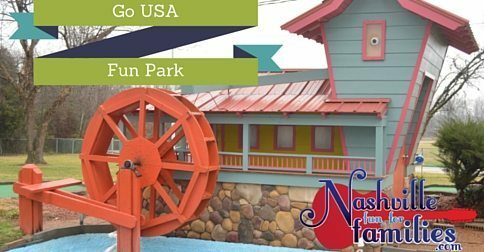 Go USA Fun Park is located in Murfreesboro, TN. birthday parties to batting cages, there is lots of family fun available at this attraction. We went on one of those gloomy, kinda raining but not really days. So please excuse the quality of my pictures. Sometimes I have to get these kids out of the house even when the weather tries to convince me to stay home. When you enter the building, there is an admission desk right in front. If you have little kids, they will probably run off to look at all the arcade offerings. There are lots of games available. This space is also where the restrooms and party rooms are located. The arcade games accept tokens and pay out tickets which can be redeemed for prizes at a special counter. There is also a snack bar and seating in this area. Outside are several other activities to choose from. You will pay for these at the inside counter and be directed by the employee from there. The mini golf course is 18 holes. There are lots of different features and challenges at each station. The course is also lighted so night play might be a fun option. Mini golf prices are $5.50 for age 13 and up and $4.50 for kids 12 and under. Directly to the right of the mini golf course is the driving range. There are 30 tees available at this range. I don’t know a ton of kids who are into golf but maybe you know an adult or two that are always looking for a place to hit some balls? Covered tees are available so you can practice regardless of the weather. The batting cages are next. You don’t have to be a little leaguer to enjoy this activity. My husband and daughters love to spend an afternoon at the batting cages. Hardball and softball are available at slow, medium and fast speeds. The last activity outside at GO USA Fun Park is probably the most popular…Go Karts!!! The track is almost a quarter mile long. The park is equipped with 20 karts so the wait should not be long even during very busy times. Kids can even ride free with a paying adult. Rides are in single or double carts. GO USA Fun Park is also available for birthday parties or large events. Details can be found at this link. Prices vary depending on activity selected. Prices listed in this post are subject to change. Please check the company website for pricing specifics.